I love the fact that it is still quite mysterious. We know that some sites are very special, and are capable of making great wines, yet we don't know exactly why, despite extensive scientific investigation. I've been re-reading James Wilson's book on Terroir (Mitchell Beazley), but as much as I find his descriptions of the geology of the various French wine regions interesting, I'm frustrated by his inability to link specific soil types to wine flavours. I have my own theories - but that's all they are. On one level, it's just a wonderful mystery that the partnership of specific sites and grape varieties yields great wines in ways we can't predict, and that there aren't that many places on earth that are capable of this. On another level, I'd love it if we could find ways of prospecting new 'great' vineyard sites more accurately, and of making great wines more available and affordable. My Pinot Noir has some signs of downy mildew. It's the first time I've had to deal with this - in the past the problem has been oidium (powdery mildew), which is prevented by using elemental sulfur. Downy mildew manifests as pale patches on the leaves, known as 'oil spots'; when you turn the leaves over, you can see the fungal infection. To prevent the mildew spreading, I've had to spray with copper (Bordeaux mixture). Both copper and sulfur are allowed in organics and biodynamics. For the last few days my back-garden vines (Bacchus, Phoenix and Pinot Noir) have been flowering. We've had brilliantly settled warm weather, too, which is so important during this process, and which means that fruit set will probably be quite good. 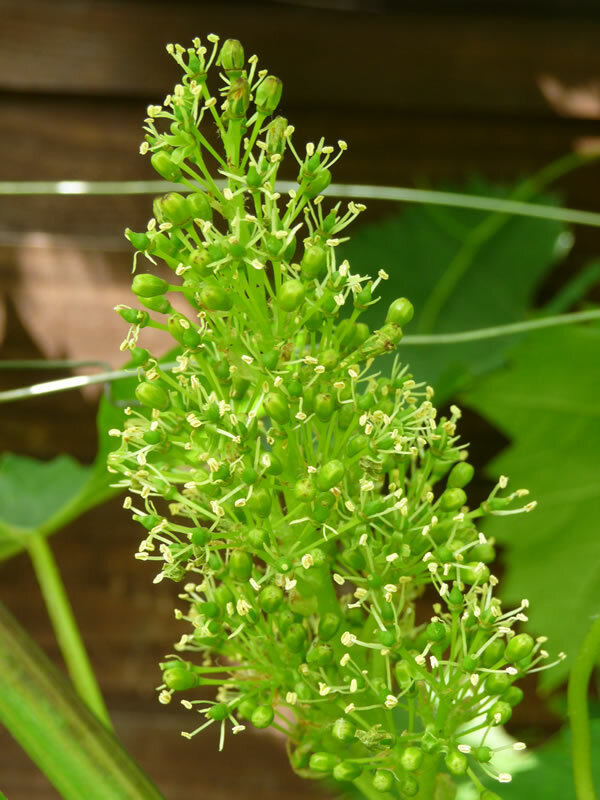 The pictures show what grape vine flowers look like. They're small and not terribly pretty. You can see that some of the flowers still have their 'hats' on, while others are fully open. Vitis vinifera, the species of vine that wine as we know it is made from, has what are known as 'perfect' flowers, with both male and female bits in the same flower structure. 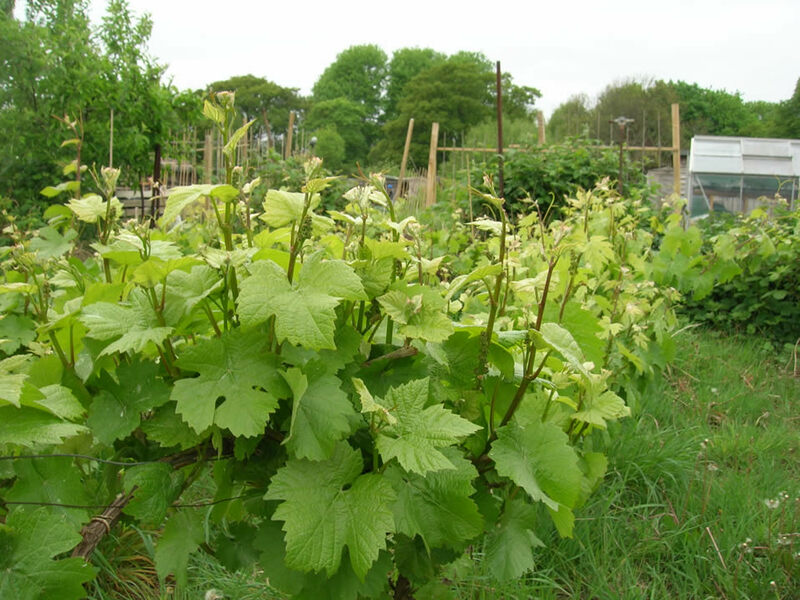 A leading expert on biodynamics kindly agreed to answer some queries I had about this unusual but increasingly important way of growing wine grapes. Here are the 12 questions I sent him. Have you got any you'd like to add to the list? Is 'naturalness' a valid and important concept in wine? Does the BD approach follow through from the vineyard to impact what goes on in the cellar? Is there a benefit to BD over what can be achieved by organics plus composting? If so, what? Are there elements of BD that people can adopt and see benefit from without taking on board the whole package of treatments and timings? How did you first get into BD? How much efficacy can people achieve with just the treatments and not the timings? What do you think about Nicolas Joly's views on the effects of electrical currents on wines? Is biodynamics metaphysical, involving a realm outside the scope of scientific physical measurement? Is BD practical for larger companies? What about BD in vineyards where the grower only owns a small section, such as the isolated blocks of vines owned by growers in the top vineyards of the Mosel? 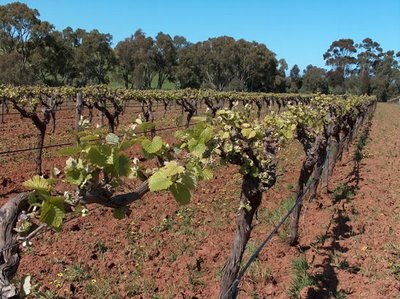 Do you see any value in trying to reconcile conventional viticulture with BD viticulture? If a top Bordeaux property came to you and asked about implementing BD, where would you start them off? It turns out that the last segment of my short trip, added as a bit of an afterthought, turned out to be one of the most interesting and inspiring. What a country New Zealand is! Let me explain the 'afterthought' comment. Just before I left the UK, I was playing around trying to get my internal flights matching up with my flight home. Nothing seemed to work, and I ended up with a flight into Christchurch at noon, and a flight out to Singapore at the same time the following day. 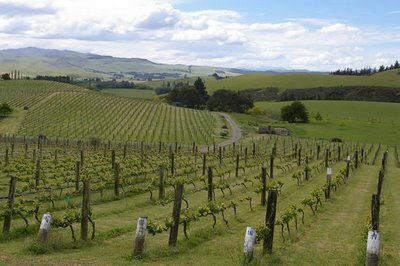 This gave me a chance to take a quick peek at Waipara, a region that's emerging as one of NZ's stars, with a particular reputation for Riesling and Pinot Noir. It's less than an hour's drive from Christchurch. But who to visit? Where to stay? I had made a loose arrangment to pop in to Daniel Schuster Wines, at Omihi, and left the rest open. 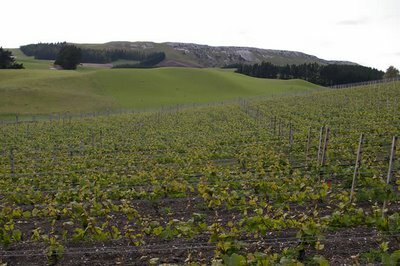 Then, on Monday, a couple of phonecalls from James Millton secured visits to Pyramid Valley Vineyards and Bell Hill, two estates I'd not come across before in the hills west of Waipara. You know how it is at the end of trips. I was quite tired, I'd been all over the place, and I was thinking about home. My energy was in the wrong place. Yet this 'afterthought' day in Waipara were really inspiring, and provided a fitting finale to my trip. I met with winemaker Nicholas Brown at Daniel Schuster Wines (http://www.danielschusterwines.com/). Immediately, just from looking at this vineyard (pictured above) I could tell that these guys were up to something different. 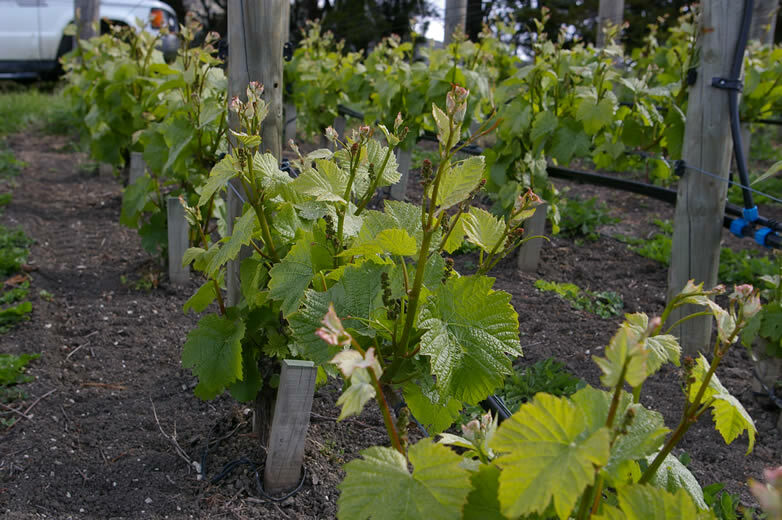 Low-trained Pinot Noir and Chardonnay, closely spaced, on gentle slopes. The wines were full of old-world complexity, poise and interest. Biodynamics is being implemented here, in part. I then headed off to Pyramid Valley (http://www.pyramidvalley.co.nz/), not knowing what to expect, other than hearing a few rave reviews and that they were biodynamic. But I had an incredible time with Mike and Claudia Weersing. Immediately, they offered dinner and a bed for the night, an incredibly generous offer. When I'm on the road I so much prefer staying in people's homes rather than in hotels. This gave us some time to spare. Mike took me to see the vineyards and gave me the most lucid, plausible explanation of terroir that I've yet heard, relating characteristics of specific sites to the wines they are making. Mike is an American who trained in Burgundy, has worked making wine in the USA, France and New Zealand, and who had a very specific idea of what he was looking for in terms of a vineyard site: limestone over clay, on which he could fashion Burgundian-style Pinot Noir and Chardonnay. The vineyards he has established look fantastic, and the first wines from them - a pair of Pinot Noirs which are not yet released - are spellbinding. My experience at Pyramid Valley was an incredible one, including a lovely dinner where we drank a 1990 Jadot Mazis-Chambertin that gained aromatic poise and weight in the glass, a 2006 Knoll Loibner GV Smaragd that was fresh, pure and peppery, and a 2006 Hirtzberger Weissburgunder that was quite beautiful. As well as Mike and Claudia's wines, of course. This morning I had my rearranged appointment at Bell Hill (http://www.bellhill.co.nz/, pictured above), with Marcel Giesen and Sherwyn Veldhuizen. Like Mike and Claudia, they have a small hillside vineyard with perhaps a bit more lime and a bit less clay. It's run along a rather Burgundian model (Chardonnay and Pinot Noir are the focus, although there are a few Riesling vines on stakes on terraces). We tasted the Bell Hill 2007s from barrel: deeply impressive, mineralic Chardonnay and structured but elegant Pinot Noir that is top-rank, and distinctly Burgundian. Beautiful wines, and a great way to finish my trip. It has been an odd sort of day. Left home this morning in driving rain; returned this evening under blue skies. I spent some time at a portfolio tasting for large agency Stratfords. Had a nice chat with Adam Eggins, chief winemaker at Taylors in the Clare Valley (known over here as Wakefield). Adam's a smart, tecchie sort of guy who makes some really nice wines. Then I met with Dr Andrew Pirie (pictured), someone I'd wanted to speak to for a while. 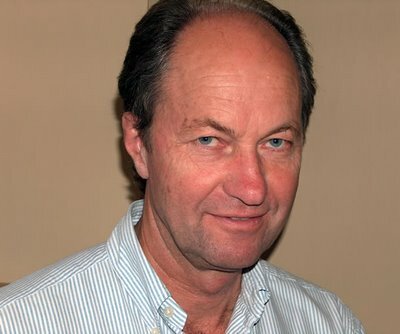 Many years ago, Pirie did a really interesting PhD on viticulture, and then founded Piper's Brook in Tasmania. After a break, he's now back in Tasmania working on his own venture, and also as chief executive of Tamar Ridge. 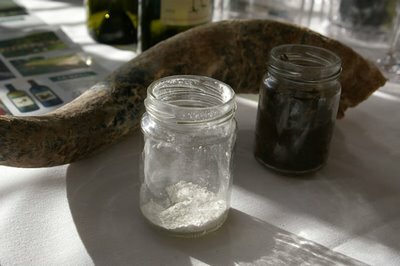 Pirie is currently working on a book about terroir. It sounds like it will be a really serious effort - if not the last word on what we know about the science of what makes grapes grow best, then something pretty close. I'm looking forward to it, but he doesn't think it will be finished for a couple of years yet. It's been one of those perfect summer days here in west London, following on from a similarly balmy, sunny day yesterday. Wandering around early Friday evening there was a hummy, buzzy sort of atmosphere - a sense that something was about to happen; as if people were set on enjoying themselves in whatever form this enjoyment might take. A spirit of leisure was unleashed. And because we've waited so long for this summer feeling, and because there isn't a lot of summer left, there was a sense of urgency - that we must make the most of this now - added into the mix, which ramps the intensity a notch. I took RTL for a long walk on Hounslow Heath this morning. 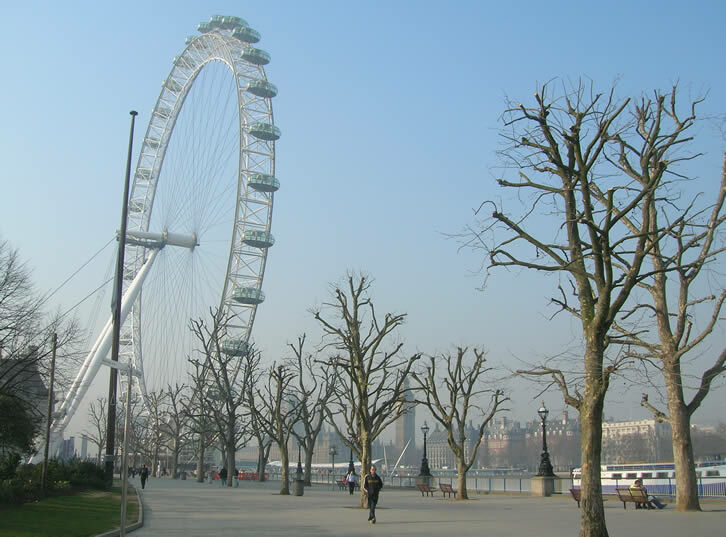 It was beautiful, and even more so because the flight path into Heathrow wasn't directly overhead today. During the course of this excursion I did a double take as I found a grape vine growing up an oak tree (pictured). 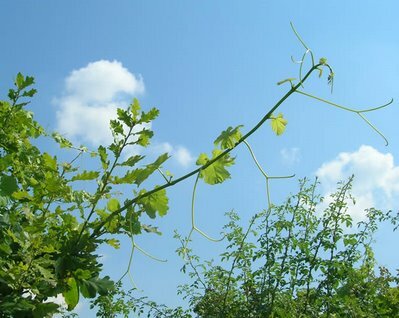 Of course, the natural habit of Vitis vinifera is as a woodland climber: it's specialized for this role, with its fast growth of narrow-girth shoots, tendrils, drought resistance and a root system that's extremely good at going deep and competing with established plants for resources of minerals and water. Where the grapevine shoot finds a gap in the canopy of its host plant, the exposure to sunlight initiates the process of flower (and thus grape) formation. However, there weren't any noticeable fruit clusters on this 'wild' vine, which is most likely derived from a table grape used to being grown in much warmer, sunnier climates. Then this afternoon I took the boys to play golf, in almost perfect conditions. Warm but not too hot, with a gentle breeze. Another reason to be happy besides the late appearance of summer is that the football season began again today, and Svennis' City team won 2-0 away at West Ham. Visited my allotment vineyard for the first time in a while. It's pretty difficult trying to work organically when (a) you haven't got much time and (b) when it has rained for most of June. My sole defence against oidium (a fungal disease that affects Vitis vinifera vines) is sulfur, and when you apply this in the rain it gets washed off. I applied some more today, but there are already signs of oidium on some of the grapes. Not good. The vines are also amazingly vigorous, and you can hardly tell where one starts and one ends. Next year I'll try to implement a vertical trellis and grow the vines in neat hedges. I'll likely have plenty of time to spend on the allotment then. Aside: Nice to see the sunshine again after so long. On the main wineanorak site I've just posted an article on Cono Sur's Pinot Noirs. This Chilean producer has led the way with Pinot, making a very respectable and affordable entry-level wine that's widely available in the UK. But the question I am asking is this: can Chile make a world class Pinot Noir? My answer (which can be disputed on a number of levels, not least, what constitutes 'world class', and who gets to decide?) is potentially, yes, but not yet. The problem I get at the moment is a sort of herby greenness, which is usally allied with sweet fruit. The combination of sweet ripe fruit with greenness is not a wonderful one. It's verging on Pinotage. 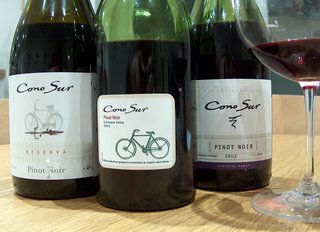 The Cono Sur Pinots I tasted are nice wines that are good value for money, but they are not yet world class. What does Chile need to do with Pinot Noir to take the next step forward? I think vineyard work is the answer. Somehow, winegrowers need to achieve homogeneous grape ripeness. The problem at the moment seems to be that as well as sweet, pure fruit with a degree of elegance, there is some green fruit getting into the same wine. I suspect winegrowers are leaving the grapes on the vine quite late in order to get ripeness, with some grapes getting very ripe and some barely ripe, resulting in the greenness plus relatively high alcohol levels. How can this be achieved? I can only make suggestions that are guesses: I haven't seen the vineyards. The first is to look at yields. Chilean vineyards ripen late; perhaps lower-yielding vineyards would ripen earlier and more evenly. I'd look at how irrigation is used: if it's necessary, then I'd insitigate regulated-deficit irrigation where it is turned off at certain points to encourage proper ripening and higher quality fruit. Then I'd look at getting the vines in balance. Perhaps they are too vigorous? Perhaps the day-night temperature differential is resulting in delayed physiological ripening and high sugar levels. Could work with the canopies be in order? Is there a need to address vine spacing? 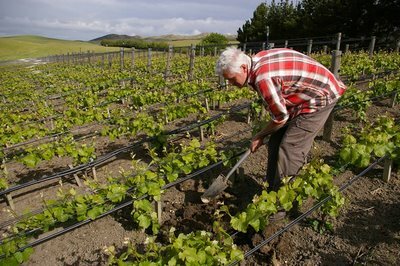 Could organic/integrated management/biodynamic principles help with vine vigour and balance? Who knows. I'm sure these are questions that Chilean winegrowers are already asking, if they are honest about where their wines are at the moment. While the boys were at cricket practice I took a chance to check on the vines on my allotment. They're motoring ahead. Looks like there's going to be a heavy crop set. As you can see, I haven't done any weed control yet. Perhaps I could call it biodynamic. If I had access to a horse, or a spare couple of mornings, I could till it manually. Saturday and Sunday have been two glorious days. Comfortable temperatures in the early 20s and blue skies. Plants bursting with new life and blossom everywhere. 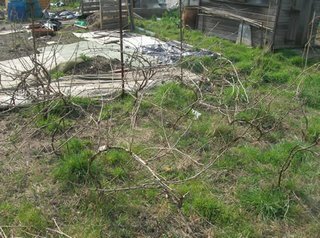 I visited my allotment to see how the vines, which I'd pruned shortly before leaving on my trip, were progressing. The answer is, very well indeed. They are about three weeks ahead of schedule. There's strong, even shoot growth and everything looks very healthy. 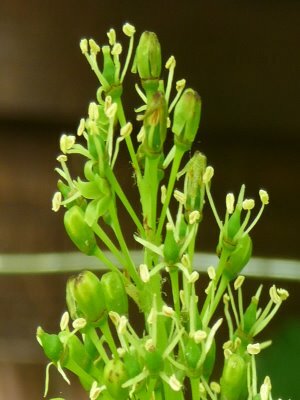 The flower clusters (plenty of them) are developing, to the extent that flowering will probably occur in a couple of weeks, which is absurdly early. Early flowering isn't a problem, as long as it occurs during a settled period of weather. And early growth is only problematic if there's frost - and so far we've been lucky. In fact, this early surge could be very good news: if everything is pulled forwards a month then harvest will be in September rather than October, lessening the prospect of rubbish weather during picking. I gave all the vines a good sulfuring. My next task will be deciding how to train them: at the moment they're on a single wire, which isn't ideal for the climate here. With the exception of a cold blip a couple of weeks ago, it has been a warm, bright spring so far, after the wettest winter I can remember. And it was another beautiful spring day today. There's something special about the gently warming spring sun, and the freshness in the air that frequently accompanies it at this time of year. 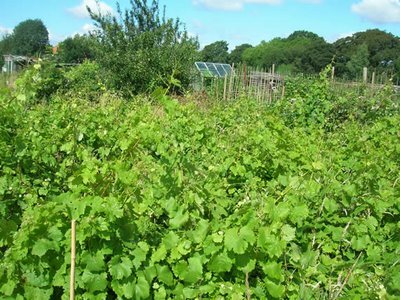 The 60 vines on my allotment were in need of a haircut - this season's pruning is long overdue. I've sort of deliberately left it late, because late pruning can help avoid frost damage by retarding budburst of the bits you want to keep. 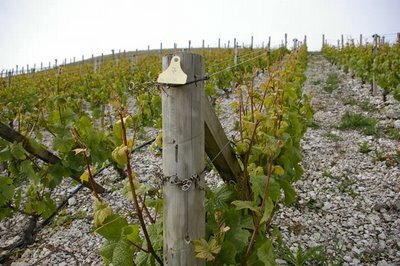 And the vines are about 20 days advanced this year, so the risk of frost damage is very high. But I also found it hard to schedule in, even though spending time messing with vines is a source of great fun to me. So this morning I spent cutting back last years growth, to leave just a couple of buds on each spur, and in some cases just a couple of canes with a replacement spur on the vines that I'm can pruning. It all feels rather brutal, but it's much needed: tough love for vines. The afternoon was spent in casualty at West Middlesex hospital because Fiona did something nasty to one of the muscles in her rib area. She was in a lot of pain. An X-ray confirmed it wasn't a pneumothorax, but they couldn't do anything else for her. No painkillers, even. And that was after a 2.5 hour wait. The kids were kindly looked after by some friends. RTL, too - and our friends have chickens, which were out when they let RTL into the garden. She got a mouthful of feathers from one of the chickens, but fortunately that was all. A nice vineyard picture. Where is it? Why do you think that? What month is it? Any other observations? Some thoughts on greenness in South African reds, prompted by comments on an earlier post. First, let me state that I'm a big fan of South African wines. I've been there twice in the last couple of years, most recently in December 2005, and I was excited by a lot of what I tasted. But at the same time, I have to say that a proportion of the red wines suffer from a green streak, which I assume is caused by a proportion of unripe grapes. What's the cause of this? South Africa shouldn't have problems with ripeness; its premium wine regions are pretty warm. Many commentators lay the blame at the door of leaf roll virus infections, which are a huge problem in many areas of the Western Cape. You can read about this here (I'm linking to Google's cache of the article; the Wine Spectator now charges for access), and there's a wonderful, but more technical article on the problem here. At one property I visited in December they replanted five years ago, and are now having to replant again, because the new planting material is already virus infected. The big problem is that, unlike phylloxera, leaf roll virus allows a crop to be produced and for it to ripen, but in many cases full physiological ripening never happens, resulting in green wines. I suspect the flavour profile of some South African reds, with sweet fruit and greenness at the same time, is caused by uneven ripening in vineyard blocks, with the virus affecting some vines more than others, or just infecting a few and others not at all. Pictured is an infected vineyard block in Vergelegen, which has been deliberately killed off with herbicides: the explanation I was given for this is that you can't just take the vines out and replant, because the soil-dwelling bugs that transmit the virus will still be there and reinfect the new vines. So you have to let the vines die, first. The vector in question is the vine mealybug (see article here), which is normally found on the aerial parts of the vine but which also has a subterranean part to its life cycle. The mealy bug is fascinating - there's a good article, with a picture of its life cycle here. Ants are also involved in the story because they protect the mealy bugs, who give the ants a feed. Because it's difficult to eradicate plant viruses, current efforts in the war against leaf roll virus are concentrating on biological control (e.g. here) and genetic modification (which isn't allowed yet).